Puppies naturally chew, bite and nip during play. It is important to train a puppy that it is not acceptable to put its mouth on any person. It is rare for a puppy to be truly aggressive. However, if biting behavior includes barking, lunging, growling, head lowering and fixed staring, consistent training and discipline is imperative. You must not let your puppy mature into an aggressive and dangerous dog. A puppy that has aggressive biting behavior is asserting dominance. A family pet must understand that his place is below, or subordinate, to people -- even children. Establish a rule that it is never acceptable for a puppy to use his teeth on anyone, even in play. Inconsistent expectations will exacerbate puppy aggression. Prohibit power struggles. Eliminate all games that encourage aggressive behavior, especially biting. Tug-of-war and wrestling reinforce the wrong instincts in a puppy with aggressive tendencies. 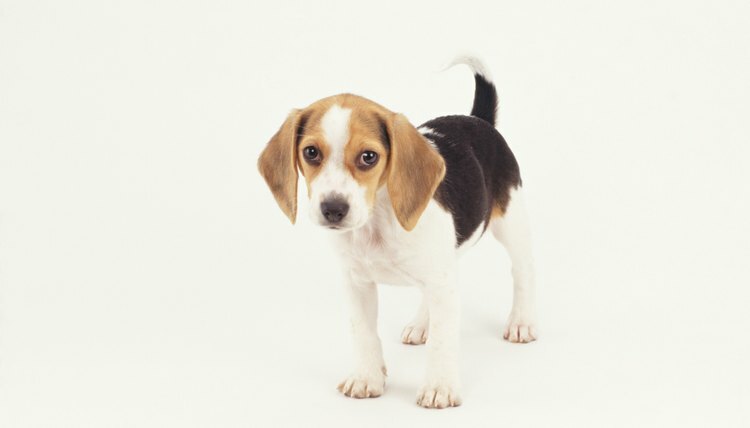 Say "No" firmly, but calmly, when a puppy exhibits any signs of aggression, including biting. Wrap your hand gently, but with authority, around his muzzle. You must show the puppy that you are in control, but not hurt or frighten him. Do not cover his nose. Repeat "No." Put the puppy in time out. Send him to his crate for quiet time -- not punishment -- and leave the room. Show an aggressive puppy that biting does not get attention. Consult a veterinarian. Eliminate all possible physical causes of aggressive biting. A puppy that is biting aggressively might be hurt or in pain. Minimize the time your puppy is alone or unsupervised. An aggressive puppy needs consistent guidance. Aggressive biting can be caused by genetic breed defects, including rage syndrome. Exercise patience. Avoid hitting, smacking, bullying or threatening your puppy. Creating a fearful environment will be counterproductive. If you are not confident in your ability to train an aggressive, rambunctious puppy, seek professional advice. Humane societies are a good resource for training and advice. Never leave small children alone with a puppy, especially a puppy that exhibits dominant behavior tendencies and aggressive biting. A dominant puppy will quickly "boss" less dominant members of the household. Biting dogs are often surrendered to shelters; seek professional assistance before the problem gets out of control.